Go on a luxurious shopping spree when you play Sale of the Century. It's based on the popular TV game, and offers up loads of chances to win! Enjoy reels filled with jewelry, TVs, designer coats and more! Look for a little luxury? 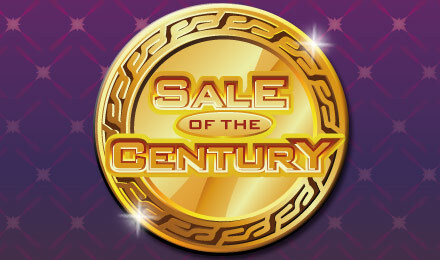 Then Sale of the Century Slots is the game for you! Get ready to shop till you drop in this 5 reel and 25 payline game based on the hit TV game. The Player is your Wild, and there are 2 Scatters. The Question Mark triggers your Super Pick bonus when 3 are spun, giving you the chance for FREE spins or cash wins. The other Scatter is the Sale of the Century Logo. There's also an instant win bonus, which can occur at any time, so be sure to look out for this rewarding surprise!